Altair provides leading electromagnetic (EM) simulation software, widely used in many industries and applications to solve a broad range of electromagnetic problems from static to low and high frequencies. Altair’s electromagnetics solver suites in HyperWorks are Feko and Flux, which are widely used across many industries including aerospace, defense, automotive, communications, consumer electronics, energy and healthcare industries. Feko is widely used in the industry for the analysis and design of antennas for industries such as, radio and TV broadcasting, wireless, cellular and communication systems, remote keyless entry systems, tire pressure monitoring systems, satellite positioning and communications, radars, RFID and many others. Feko’s Method of Moments (MoM) solver is used for antenna design but also antennas like reflector antennas, antennas for radars, and antennas with radomes; they can all be very efficiently analyzed with Feko thanks to model decomposition (where equivalent sources are generated and used) together with accelerated full-wave methods like Multi-level Fast Multipole Method (MLFMM), or asymptotic methods like Physical Optics (PO), Ray Launching Geometrical Optics (RL-GO) or Uniform Theory of Diffraction (UTD). Antenna arrays can be also very accurately and efficiently analyzed with Feko, thanks to features like its Domain Green’s Functions Method (DGFM) method for large and finite arrays. Many techniques exist for the simulation of antennas in free-space. In practice, such antennas are mounted on physical structures, which significantly influence their free-space radiation characteristics. Measurements of the radiation characteristics of an antenna mounted on a large platform are difficult, or even impossible to perform. Therefore, the challenge exists to accurately simulate, the interaction of an antenna with electrically large environments. Over years, Feko has gained a lot of reputation for antenna placement becoming the standard EM simulation tool for placement of antennas on vehicles, aircraft, satellites, ships, cellular base-stations, towers, buildings and others. MLFMM and the asymptotic solvers in Feko (PO, RL-GO and UTD), together with model decomposition, make Feko the ideal tool to solve antenna placement and co-site interference problems on electrically large or very large platforms. 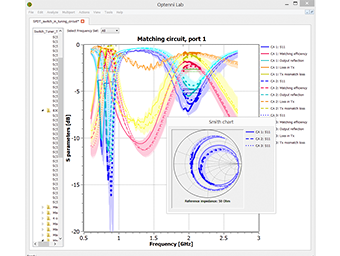 Regarding matching circuit design, Optenni Lab, developed by Optenni Ltd. and available through Altair sales channels, provides fully automatic matching circuit generation and optimization routines. The user only needs to specify the desired frequency range and number of components in the matching circuit after which Optenni Lab provides a choice of optimized matching circuit topologies. Optenni Lab uses accurate inductor and capacitor models from major component manufacturers and a fast tolerance analysis to ensure that the manufactured matching circuits will meet the design criteria, making it an ideal tool to complement Feko. For customers interested in Antenna Magus, antenna synthesis tool from Magus (Pty) Ltd, it is also available through Altair sales channels. It offers a huge searchable collection of antennas, which can be explored to find and design antennas to user specification. Ready-to-run Feko models can be exported, which makes Antenna Magus a tool to complement Feko. Electromagnetic Compatibility (EMC) has become a key and sensitive topic for OEMs and their suppliers in many industries. It is not only important to ensure electromagnetic problems will not occur when integrating components and devices in a system, but also to fulfil the related EMC regulations. Since many years ago Feko and Flux are used for EMC to simulate problems related to Electromagnetic Interferences (EMI) and Electromagnetic Susceptibility or Immunity (EMS). Feko includes a complete cable-modelling tool to analyze both radiation and irradiation of cables into or from other cables, antennas or devices, which can cause disturbance voltages and currents resulting in malfunctioning the system. Feko is also used to simulate radiated emissions of Electronic Control Units (ECU) in a system, shielding effectiveness, radiation hazard analysis, electromagnetic pulses (EMP), lightning effects and High Intensity Radiated Fields (HIRF). On the other hand, Flux is able to evaluate the magnetic field radiated by power cables and busbars. The effect of external fields on the operation of electromagnetic devices such as sensors or actuators can be determined. It also allows designing efficient shielding. The scattering properties of an object are related to the spatial distribution of scattered energy when the object is exposed to incident electromagnetic fields. Two typical scenarios where scattering is important are the design of systems to detect objects, like collision detection systems, and the design of objects so to increase or decrease its detectability by a transmitter, like a stealth aircraft. The variety of numerical methods in Feko, including MLFMM, RL-GO and PO, together with its post-processing capabilities, permits to solve scattering and Radar Cross Section (RCS) problems very efficiently and accurately. Waveguides have been widely used since the first space communications in the defense, aerospace, marine and communications industries, for components like couplers, filters, circulators, isolators, amplifiers and attenuators. Feko is used to simulate waveguide components, where waveguide port excitations and Feko's MoM and Finite Element Method (FEM) solvers are typically used. Microstrip technology is used to design planar circuits, like couplers, resonators and filters. When circuit trace lengths become comparable to the wavelength, full wave 3D EM analysis is used. The Planar layered Green’s function and the Surface Equivalent Principle (SEP) formulation in Feko are very well suited to analyze printed microwave circuits. 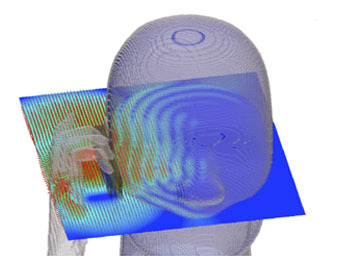 EM simulation plays a relevant role in the development of biomedical technologies, where simulation offers valuable insight into the interactions of electromagnetic fields inside or in the close proximity to the body. Due to the lossy nature of biological tissue, transmitter design typically focuses on ensuring that sufficient signal is radiated and not lost in the anatomical load, while complying with regulations that limit the specific absorption rate (SAR) and the maximum thermal increase in the body. Typical applications are related to mobile and wireless devices, RF fields inside automobiles, hearing aids, body worn antennas, MRI, implants, hypothermia, and others. FEM, Finite Difference Time Domain (FDTD) and MoM/FEM methods in Feko are very suitable for these applications. Feko includes a database of different human body models. WinProp is a leading software for wireless propagation modelling and radio network planning. It includes highly accurate and fast empirical, semi-empirical, rigorous 3D ray tracing models and the unique Dominant Path Model (DPM) for a wide range of scenarios, including rural, urban, indoor and vehicular, while supporting arbitrary transmitters like cellular and broadcasting sites, satellites, repeaters and leaky feeder cables. 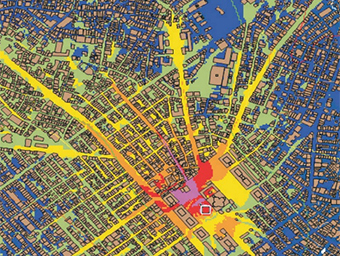 Depending on the scenario, predictions are based on topographical, clutter, urban building and/or 3D planar objects. Besides the predictions of the path loss also the delay and angular spread can be computed as well as LOS/NLOS, directional channel impulse response, angular profile and propagation paths. The antenna radiation patterns simulated with Feko can be imported and used in WinProp. Various air interfaces and applications are pre-defined: broadcasting, cellular, wireless access, WiFi, Ad-hoc sensor networks, ICNIRP & EM compliance. Depending on the applications WinProp offers static, Monte-Carlo and dynamic network simulators. It allows the planning of coverage and capacity as well as network simulations (performance of algorithms, analysis of delays and others). The user can define the traffic for circuit and for packed switched services. Altair offer a full suite of tools to render the machine complexity simple, realistic and accurate. It addresses all types of motor machines, from pre-design to accurate validation steps through optimization. Flux 2D/Skew/3D Finite Element comprehensive package includes a dedicated tool for motor design with specific functionalities. It is reputed for its accuracy and its capability to take into account different levels of requirements at the various design stages, including drive & control to test the dynamic interactions for a better system prediction. To go further into physics analysis, there are some dedicated applications with electromagnetic analysis of course but also thermal or vibro-acoustic analysis. Motor Overlays templates driven dedicated environment are fast and easy solutions for rotating machine design. The provided libraries of components (rotor types, slots shapes, windings) features most common components used in the motor industry. Those libraries are completed by numerous features (slits, eccentricity, cooling holes, bifurcated teeth, lamination shape, …) whose dimensions and number are fully customizable. Defined from well-chosen parameters within a modern GUI, the motor model does not require any FE skills. Mesh is indeed totally driven by a single and editable parameter, allowing the engineer to concentrate on the design itself. Natural multi-parametric capabilities will enable to easily compute values such as back EMF, flux density in the air gap, cogging torque, iron losses, currents, no load and loaded start-up, short circuit, phase line-to-line voltages, and much more. Magnetic sensors are used in a wide range of applications in every field, including industry, transport and building. The role of the sensor is often crucial for the proper functioning of systems or for the safety of people, for example Antilock Braking Systems sensor (ABS), camshaft sensor or machine tool sensor, etc. electromagnetic actuation is commonly used for control and safety in many different industries. Even if the technology is well known, the introduction of electronics or permanent magnets allows for performance improvement, for example to open/close faster or to reduce the energy consumption of the actuator. For each application, those devices have to respect precise specifications, such as detection range, measurement error, condition of operation (temperature range), response time, and energy consumption. Besides the main challenges of the energy industry and related high power electrical equipments (transformers, insulator, power bars, circuit breakers), high efficiency levels and safety are on top of the list of design challenges. Reducing the losses and optimizing the global performance requires an accurate modeling of electromagnetic fields and may involve various types of analysis (electric, thermal, structural), taking many different constraints into account. For the design of any transformer and inductance, Altair offers a wide range of innovative software solutions. Hold high voltages and avoid dielectric breakdowns are very important challenges in electrical engineering. Flux allows designing any kind of electrical equipment in 2D and 3D, single or three phases, enabling easy steady state AC magnetic analysis, such as no load or short circuit tests, but also transient behavior, such as inrush current, geomagnetic current effects, or even electrostatic analysis to study electric fields to prevent dielectric breakdowns between coil windings or computing the parasitic capacitance. Advanced functions, like streamer criterion enables predict voltage breakdown, with possible paths, enabling users to improve the device geometry. Flux will also greatly help to check the nominal power that can be carried by power conductors, calibrate insulating parts to avoid dielectric breakdowns, check induced lightning currents, keep parasitic capacitance values under control, or check cable temperature variations to keep the high level of performance. Various heat treatment processes such as heating, brazing, welding, forging, hardening, and sealing need to be modeled in order to tune and control the whole process before the prototyping. For more than 30 years Flux offers innovative solutions in the simulation of magnetic and electric heat treatment phenomena for design, analysis and optimization of any heat treatment process. Thanks to advanced modeling tools taking into account temperature dependent physical phenomena, Flux allows studying any heat treatment process completely and efficiently. Easy to use, it offers a unique Steady State AC Magnetic coupled with Transient Thermal application, allowing the user to post-process magnetic quantities in the same model (flux density, currents, Joule losses, electromagnetic forces), thermal quantities (temperature color map distribution, time dependent temperature curves, thermal loss) and time dependent materials property variation (permeability, conductivity, thermal conductivity, specific heat). Furthermore, motion and electrical supply can also be directly taken into account in order to complete the study. Coupled electro-thermal conduction is also available in the same way. 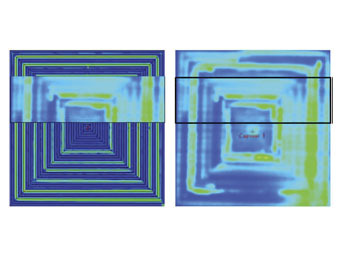 For even more detailed thermal analysis coupling to any 3D CFD software, such as AcuSolve, is possible.